An adaptation of Stephen Leacock’s Sunshine Sketches of a Little Town, presented 31 Mar 1954 on CBC radio as The Hero of Mariposa and 19 Dec 1954 on CBC-TV as Sunshine Town. 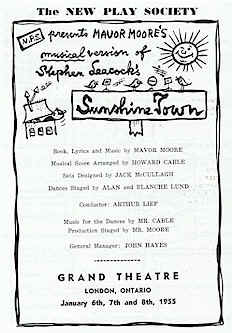 Probably the most ambitious Canadian musical to that time, Sunshine Town had performances at the Royal Alexandra Theatre 10-22 Jan 1955 and the Orillia Opera House; and by the New Play Society (of Toronto) in 1956 in London, Ont, Toronto, and Montreal. It was revived in 1968 at the Charlottetown Festival and in 1984 at the Mariposa Festival. Selected songs from Sunshine Town and Spring Thaw have been published by BMI Canada.